Last night the Man and I decided to stroll on over to a neighborhood festival. We had a lot of fun and ended up staying out way to late. We saw a lot of friends' listened to music and feasted on empanada's and potato balls stuffed with meat. I gotta tell you those babies were great. I'm going to figure out how to bake instead of frying them. Today I went on another farmer market adventure. My cousin is here from Georgia and we decided to spend the day together. The market we went to is in Chesterton, In. It's close to Lake Michigan and just a charming little town. I came home with my arms full. The fedora's I ordered finally arrived one gray and one straw. I bought some delicious looking "naked" soap made out of all natural ingredients and of course, couldn't leave without a couple of giant croissants and a loaf of incredible herb bread. Hope your Saturday went well. We might be off the the festival again tonight.. 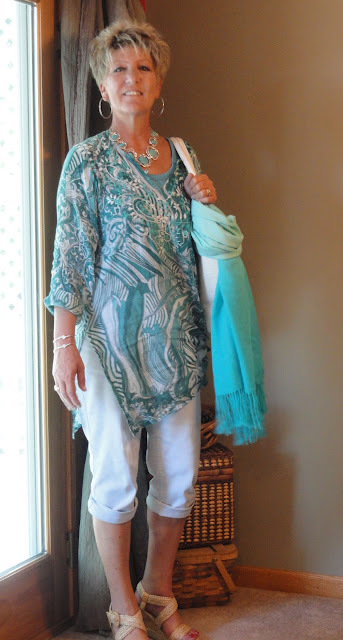 This tunic always reminds me of the ocean (hence the post title). I bought it as a beach cover up for a trip to Florida. I think it has been worn every way but the intended. It's pretty long so I gathered the sides to give it an asymmetrical look. Tammy, you look gorgeous in that color! It's a lovely color for a day at the market and those potatoe balls sounds marvelous. Share the recipe? oh gosh I love the outfit and that color is beautiful on you. Love it--you look so cool and elegent!! Welcome back Tammy- great to see you and your fab style back in the blogosphere! :) Love this blue flowy top on you and markets are such a great place to pick up local, organic ingredients! Yay for fedoras- I was wearing a new straw one yesterday!